Phonographic Copyright (p) – Composers Recordings, Inc.
Phonographic Copyright (p) – Electronic Music Foundation, Ltd.
Phonographic Copyright (p) – Lovely Music, Ltd. Copyright (c) – Universal Edition (London) Ltd. Copyright (c) – G. Schirmer Inc.
© ℗ 2000 Ellipsis Arts. Cover is a schematic of the RCA Theremin, 1929, courtesy of Robert Moog. Other photos courtesy of Raymond Scott Archive, Robert Moog, INA-GRM, Dr. Dorothea Eimert, Gayle Young, Meyers Rosenblum and Herman Shulman, La Monte Young, CRI, Intl Mgmt Group, Yoji Yuasa, Morton Subotnick, Mode Records, The Cortical Foundation, G. Schirmer, Inc., Kate Dodge. Issued as 8-panel Digipak with transparent trays inside a matte/clear with white/silver printing plastic slipcase, including a 100-page booklet featuring quotes from the artists, photos, and extensive notes. 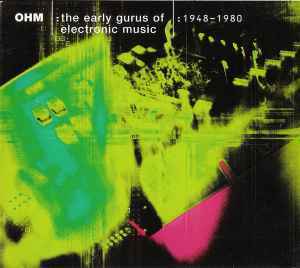 The tracks are presented here chronologically, and if you've read Joel Chadabe's book "Electric Sound: The Past and Promise of Electronic Music," then this makes an excellent accompaniment. Track 1-15 is mistakenly the totally non-electronic 'Phonemena For Soprano And Piano' from Philomel and not the listed 'Philomel'. Also many of the tracks have inevitably been severely edited. Track 1-15 is an acoustic piece. Clearly what they meant to use was the electronic version of Philomel, which you can find on YouTube. Highly recommended for anyone who has an interest in how all of this got started, and has a taste for experimental electronic. You won't find much in the way of beats and structure often, because in many cases what you are hearing on the track is the first time such methods were even used. These are the pioneers. The ones who invented the synths and the algorithms in them, with names like Chowning, Theramin, and Moog in the credits; the ones who strung thousands of feet of wire around a studio to see how it would distort a sound wave; built elaborate "sonic rooms" where the audience would walk around triggering effects, creating their own personal roar. The book that accompanies the 3 disc set is gorgeous. Full color, glossy, and around 100 pages long. It includes not only detailed information on each song and artist on the three discs, but a wealth of tangental information as well, such as history, engineering, artist's thoughts, and so on. It is by no means a substitute for a thorough essay on the history of electronic music, but far, far more than you usually get in even a box set. As for the music itself, it is great stuff, though a bit "out there" in some cases, and not really something you would just put on as background music. For instance, track eight on disc three features nothing but the murmering of Robert Ashley's personal thoughts surrounding his work. Other songs are practically sonic blasts that are almost akin to the Noise genre. Alas, a lot of the music has been edited and shortened, as noted above. It is understandable though, especially considering the fact that some of the tracks are excerpts from hours long shows. The good news is that you would have a hell of time procuring all of this music on your own, especially since some of these tracks have never been released before. Some highlights: John Cage's Williams Mix, here is a song with a score that is over five-hundred pages long! From a technical standpoint, very interesting. No doubt it could be accomplished in no time with today's technology, for 1952 it was a huge achievement. Terry Riley's long, completely improv organ sets with an eastern influence. Amacher's petri dish approach to dynamic, three dimensional sound sculptures (woefully handicapped in their stereo form.) It's all good though.